Best gaming protection – SafeSlot, pre-mounted I/O shield, and carefully-selected premium components for maximum durability. ROG gives you more – More gaming-focused utilities, all free! 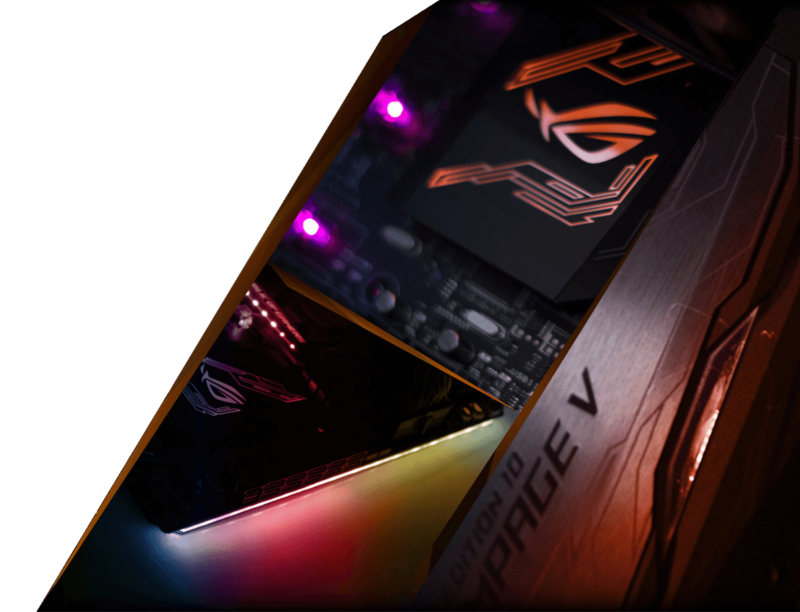 The revered Republic of Gamers (ROG) has delivered exemplary design and performance to thrill the world’s best gamers and PC enthusiasts for a whole decade. But our work has only just begun. Gaming’s glory-seekers have won countless battles with Rampage V Extreme, and we’re ramping up the armory with Rampage V Edition 10 — a unique version of our extreme-gaming motherboard, specialy made to celebrate ROG’s 10th anniversary. To be ROG is to be the rebel. To be ROG is to break every rule. It’s time to be the rebel and break every rule, with Rampage V Edition 10! Build with Rampage V Edition 10 and you'll build… BRIGHT! With a built-in Aura RGB-strip header and easy lighting controls, it's never been easier to light up your rig — and your LAN parties! Rampage V Edition 10 includes the amazing Aura lighting-control utility to cast stunning multi-color glows across your gaming rig, via the motherboard's powerful built-in RGB LEDs or attached RGB strips, or both — and in perfect synchronization! Fire up Aura and then enjoy the creative freedom of nine different lighting schemes. You’re even able to sync your lighting style with the ever-growing portfolio of Aura-capable gear. Forget the faff of external RGB controllers! With ROG's Aura RGB-strip header, it's quick and easy to cast brilliant colors across your rig and room: just slide standard 12V RGB strips onto the 4-pin Aura RGB-strip header, then weave your lighting any way you like. And, ROG has teamed up with well-known strip-makers and case manufacturers for great synchronized effects and best compatibility — so you'll light up as easy as RGB wherever you see the Aura Ready logo! *The Aura RGB-strip header supports standard 5050 RGB LED strips with a maximum power rating of 2A (12V). For maximum brightness, strip length should not exceed 2m. *One extension cable is included. RGB LED strips need to be purchased separately. The digital-to-analog converter with a high signal-to-noise ratio (SNR) and a digital volume control for the purest analog output. The best components were chosen for every component in the analog stage to mini-mize distortion. 2 x LM4562 op-amps (one per channel) provide a clean stable volume boost and better channel separation. The TPA6120 headphone amp provides the final boost in volume allowing the amp to unlock the true potential of any headphones. Automatically detects and optimizes outputs for different headphone impedance (32-600 ohms). High-accuracy timing technology ensures ultra-low jitter by preventing fluctuating tem-peratures. Dedicated relay eliminates the popping sound when the system is powered on or off,or devices are attached or removed. Greater performance means smoother gameplay — and that means more chances to win. With the best overclocking (OC) design, UEFI BIOS and intuitive OC gadget and utility, you’ll enjoy unmatched performance — coupled with an exclusive cooling design ensures your system never breaks a sweat. UNLEASH THE TRUE PERFORMANCE OF INTEL CORE I7 PROCESSORS FOR LGA 2011-V3 — TODAY AND INTO THE FUTURE! Let loose up to 10 cores with new Intel® Core™ i7 processors for socket LGA 2011-v3, in both 28— and 40-lane options — and awaken the true multi-threaded performance! Rampage V Edition 10 is engineered from the group up to squeeze every last drop of power from Intel's latest architecture, so you'll always be one step ahead! Second-generation ASUS T-Topology pushes DDR4 memory overclocking to over 3333MHz with all memory slots populated — and that means the best-ever gaming performance from your Rampage V Edition 10 rig! Featuring a customized trace layout for reduced crosstalk and coupling noise, second-generation T-Topology ensures time-aligned signal transfer for improved memory stability and compatibility. ROG understands overclockers better than any other manufacturer — so Rampage V Edition 10 includes loads of hardware-level controls to aid your overclocking adventures, including DIMM and PCIe switches, Safe Boot and ReTry buttons. They're quick, easy and real time-savers! DIMM switch Manually activate or deactivate the DIMM sockets without removing memory modules, for incredible convenience and greater stability. PCIe x16 lane switch Manually activate or deactivate the PCIe x16 pass-through lanes without removing graphics cards, enabling faster configuration and enhanced stability. Safe Boot Button One quick tap of the Safe Boot button powers off your system and launches into Safe Mode, where you can tweak your retained previous settings. ReTry Button If your system hangs during the power-on self-test (POST) boot process, just hit the Rampage V Edition 10's hardware-level ReTry button to force a reboot right away. MemOK! Forget memory-compatibility worries, as this one-click system-recovery tool offers effortless memory upgrades. ONE CLICK OVERCLOCK AND COOLING, DONE! GET PERFORMANCE, EFFICIENCY, DIGITAL POWER, FAN CONTROL AND EVEN NETWORKING AND AUDIO TUNING TAILORED FOR YOU — AND THE WAY YOU PLAY! You don't need to be an expert to max out gaming performance on your Rampage V Edition 10 build — because 5-Way Optimization sorts all the complex settings with a click, for instant, highly-controllable performance boosts! Our exclusive technology dynamically optimizes essential aspects of your system based on real-time use, so you get superb CPU performance, everyday energy savings, ultra-stable digital power, cool and quiet fans and even networking and audio settings that are tailored for the apps that you are using. In short, 5-Way Optimization ensures that your PC is perfect for gaming, entertainment, productivity or just about anything else! Games run swiftly and smoothly with high performance, prioritized bandwidth and vivid sound. Fans stay whisper-quiet for everyday computing, and ensure extreme cooling efficiency when gaming. Stutter is eliminated for smooth-running apps, even under heavy loading. Energy waste is reduced so you'll save money. 128 Mb Flash ROM, UEFI AMI BIOS, PnP, WfM2.0, SM BIOS 3.0, ACPI 5.0, Multi-language BIOS, ASUS EZ Flash 3, CrashFree BIOS 3, F11 EZ Tuning Wizard, F6 Qfan Control, F3 My Favorites, Quick Note, Last Modified log, F12 PrintScreen, and ASUS DRAM SPD (Serial Presence Detect) memory information.